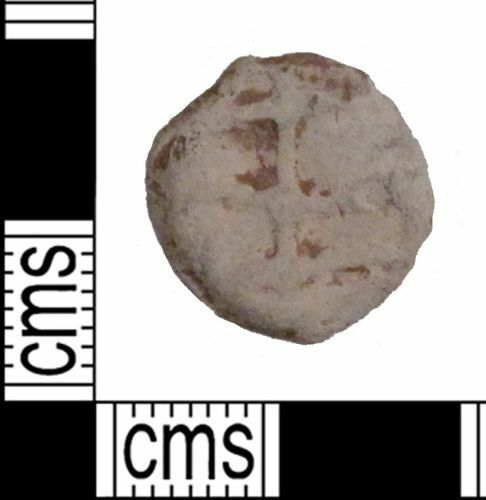 A complete Medieval to Post Medieval cast lead alloy uniface token, dating to c. AD 1250-1800; Powell type 7. The token is decorated on one side with a grid design. The other side is undecorated and flat. The token is of a greyish-white colour. It measures 16.06 mm in diameter, 2.32 mm thick, 3.49 g in weight. Tokens were easy to make and distributed widely throughout a large period of time; therefore, they are difficult to date precisely. They are thought to have been circulated throughout both the Medieval and Post Medieval periods and those with simple designs are given a general date of c. AD 1250-1800.